Fainshtein, Shevchenko, and Xanos work with light projection installation focusing on personal narratives of body, memory and perceptual shifts light as media. 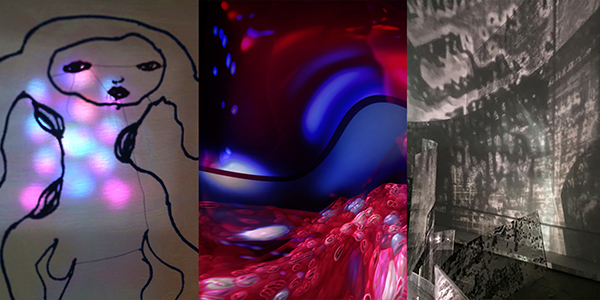 The artists explore light as mediated through a spectrum of materials, including printmaking, animation, and digital processing. For the Light Matters exhibition Fainshtein, Shevchenko, and Xanos would use various iterations of projected and reflected light to investigate synthetic relationships within their constructed image/space immersions.Each site specific interactive installation would create an immersive environment for the viewer to experience within a particularly composed architectural space. Margarita Fainshtein was born in Ukraine and studied Fine Arts for nine years. She moved with her family to Israel where she obtained her BFA at the University of Haifa. Currently, Margarita is enrolled in MFA program at the Art Institute of Chicago. Fainshtein’s Art background is international and culturally complicated. Her works have been exhibited in USA, Canada, England, Israel and the Ukraine. Margarita is currently living and working in Halifax, Canada. My name is Margarita and I struggle to say where I am from. I am from many places, and I have always wanted to belong. I was born in Ukraine, repatriated to Israel and then immigrated to Canada. I am Nova Scotian, however, I have other cultural identities, which interact with each other and make me who I am. Through our lives my family and I were categorized by the national aspect and were treated accordingly. In Canada, for the first time in my life I open my passport and see “Canadian”, with no other national adjectives. I am very interested in motions of Time, History, Memory, Erasure and Culture. I am attentive what happens at the intersection of these concepts when applied to cultures and generations crossing. How do immigration and other cultural notions interact with political, social, and cultural infrastructures? How are political movements connected to individual’s history, forming the global one? I collect my multi- generational family identification documents from around the world, and reproduce them by layering them down using printmaking techniques. I think about language as an object and a representational tool of culture and memory. I wonder if the memories, layered one upon another, become buried in the past or are there remains left from the former layer, life, and identity. Through printmaking process I create relief and screen prints that combine to build a new unified identity. Enlarging the prints I make them monumental, telling not just my personal story, but reaching out to those who have also lost their identities, looking for the safe place. I work with lights and shadows to create interactive installations, where audience becomes part of it, influencing and changing the space by their presence. I am fusing into the paper, fabric or plexiglass documents from couple generations and embossing them into the surface. During this process I am loosing patterns of official papers by obtaining new vibrant identity, mixing languages and cultures where my family lived. Some elements of it are still visible, while the others are completely erased. I talk about mutual history and re-enact it. Valerie’s artistic practice is interdisciplinary as well as multi-faceted. As an artist, she works in analog and digital media to create site specific, immersive installation art. Valerie also creates in the media of paint, collage, and photography. Her current work, Exiled in Light :|: Never(W)here uses light projection and LCD installation to focus on psychological narratives of body, memory, and perceptual light shifts. She explores light as mediated through a spectrum of materials, including fiber/acrylic constructions, animation, and digital processing. Each site specific, interactive installation creates an immersive environment for the viewer to experience within a particularly composed architectural space. This phenomenological installation provides metaphoric portals to sublime light and dark visions based on an experience of being exiled in an alternate universe which is both tragic and sensual, sinister and soothing. Slow, mesmerizing animations play in seamless loops, meant to evoke an alien, viscous world of vascular tides. The animations are made from altered layers of abstracted still images. These photographs of light and reflection are taken in the dark and express conflicting and sublime emotions about the nature of light and dark. Valerie earned a BFA (1991) from The School of The Art Institute of Chicago and The Glasgow School of Art. She later became faculty in SAIC’s Young Artist’s Studios and Adult Programs. She is currently pursuing her MFA through SAIC’s Low Residency program. Valerie Xanos is a teaching artist in the Chicago public school system to be an agent of change for young artists. Valerie grew up and still lives where she teaches, sharing a connection to her students through community. A 22 year veteran of CPS, her work as a practicing artist informs her practice as a teacher. She teaches a Guerrilla Art Collective class at Curie Metro High School that focuses on creating civically engaged artworks. Students and teacher work as participating artists, tearing apart the teacher-student hierarchy for a democratic approach to learning. 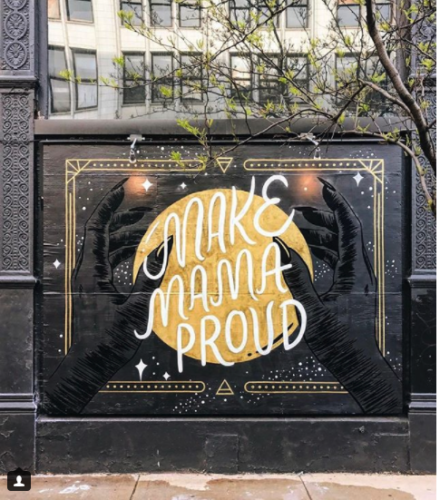 Her artist/teacher practice was recently spotlighted in SAIC’s biannual magazine, which “tells the stories of faculty and alumni whose work as artists, designers, scholars, and educators engages the audience to make positive changes in our world”. I am a Moscow born, Chicago based multimedia artist, my work has been shown at numerous venues nationally and internationally, including international Art Fairs in Miami and Chicago, Berlin’s Director’s Lounge Video Festival, New York’s Red Shift Film Festival, Chicago’s Motion Graphics Festival, Media ART LAB segment of Moscow International Film Festival, where her work took a second Prize in 2007; Museum of Contemporary Art Chicago, Art Institute of Chicago and numerous Chicago Art galleries. My practice encompasses multiple modes of expression and image processing: I am experimenting with precision of digital fabrication, visceral materiality of printmaking and fiber production, drawing, animation and video matter. My work is preoccupied with creating and processing the image of a body: body in its beautiful disobedience. I am interested in its multiple iterations: as a vulnerable, magnificent life giving entity, body in transition, androgynous, animal body, non-human/post human body. A grotesque body of a Monster >> Mother/Other: distorted, powerful, vulnerable, loving and procreating. My Monsters >> Mothers/Others inhabit the liminal world of primordial desire. Mothers in production, beautiful others, queer and playful embryos and embryo carriers, primal, ancient and omnipotent cyborgs. They contaminate each other with longings and diseases. I have perfected their beautiful deformities: their bodies are fluid, transforming, rebellious, excessive. Adorned with extruded lesions, dangerous flowers of cancerous malformations, aged, diseased bodies, are all bodies loving and loved. I cannot help procreating, mothering, populating my world. I breathe making and mothering. I constantly re-contextualize my drawing, but the form, the human form in metamorphosis remains. My constructions are self-portraits, infants, feminine and androgynous bodies in flux. I work across media: in two & three dimensional space and in the temporal/spatial entity of video: projected on screens, monitors, and on laser-cut & projection mapped luminous tapestries. I draw, digitize, deform, animate, laser-cut plastic, plasma-cut steel, embroider, print, dye, wash, powder coat, construct, install, audio score, project, film, digitize. The sequence is unbounded. It starts with an intuitive sharpie sketch and continues on living through the infinite cycle of mediation. The mediums I work with bleed into one another: projection is spilling into the embroidered lines and is being contained/ reflected through laser cut suspended bodies and devore velvet. Exquisite moving and interrupted lines and reflections put the images into the constant condition of rhizomatic becoming, contaminating; expanding and contracting space and time; immersing and extruding; glowing and reflecting… There is no resolution in the infinite dances of my Monsters >> Mothers/Others. I muse with the idea of flesh, but I operate within the virtual matter; apparent through visceral movement, vibrant and digital. My world is the utopian happy seductive and irresistible ecosystem populated with bodies within existential crisis, constantly unfolding condition of seduction, desire, intimacy, disease. My Monstrous Mothers/Others are grotesque creatures ever becoming and transitioning between the worlds, across media, teasing with art historical references and looking into the future. I question origins and destinations, gender power structures and condition of vulnerability. I am attempting to create iconographic taxonomies that transcend the condition of femininity and motherhood into the visually exquisite, beautifully grotesque constructions.